I've been writing about hackathons and the planner application I've been busy with for a while now. 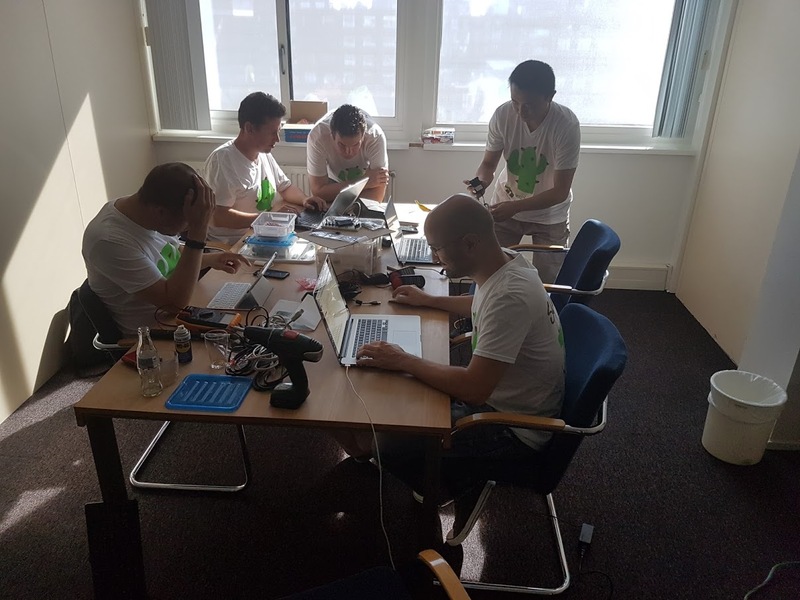 The news is that Hackathon Planner is live and used during the last hackathon event on 25 August 2016 at NIPO Software. 36 hackathon ideas were created, voted and team compositions were made using the software. You can see it in action here. This post however, is about something else. 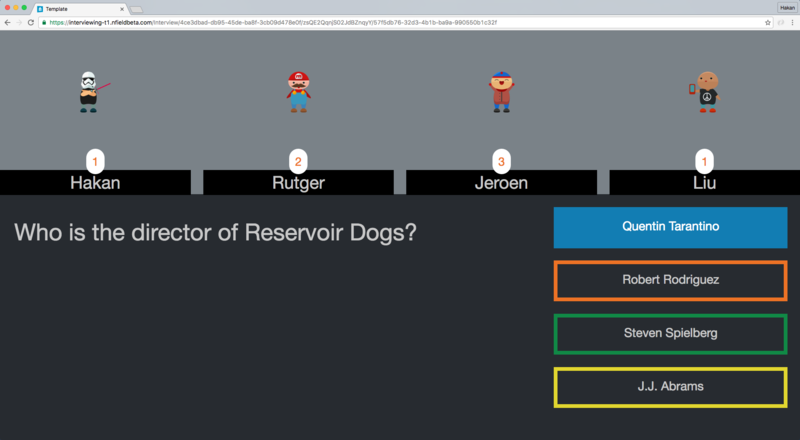 It's about a crazy idea of my colleague Rutger de Jong and how we brought it to life during that last hackathon day: Converting Nfield into an online quiz game that can be controlled by PlayStation Buzz controllers. A shared screen with a browser is opened and an online interview is started by visiting a specific URL to Nfield. This online interview is running our little quiz. Each player grabs one of the PlayStation Buzz controllers that are connected to a computer runing a node.js application to interpret inputs coming from the controllers. A random sequence of questions start appearing on the screen, each for 10 seconds. Players give their answers to each question simultaneously. These answers are received by a node.js application listening inputs from Buzz controllers and pushes events to the app running on Hyperdev. Application running on Hyperdev acts as a message hub and broadcaster. It relays the incoming messages to the quiz running on Nfield and also to the Raspberry PI. The quiz, running on the browser, receives these message (via our customized template) and picks the corresponding answers selected by players. As time is ticking away for each question, the customized template that's running the quiz emits events to the Raspberry PI, telling it to buzz and blink harder. Scores are continuously calculated as quiz progresses and in the end the winner is announced. All in all, once again, it was a great event at the NIPO Software office in Amsterdam. Who knows.. maybe in the very near future, this little fun project can be put into actual use during various market research events. Without a doubt, it showcases the power of Nfield and how customizable it is for variety of scenarios. If you want to know more about each component and what it specifically does, read on. Hyperdev is a prototyping environment where you can start up and develop a simple node.js application right within the browser and see your application up and running live in a matter of seconds. Every time you save a file in your project, hyperdev deploys it automatically in an amazing speed. It uses docker containers and AWS behind the scenes. It also supports https out of the box, which was important for our purposes (Nfield services run on https so should any integration or extension with it). This node.js app running on hyperdev is our orchestrator. It is basically responsible with broadcasting incoming websocket messages to all subscribers. Each piece of the puzzle (buzz controllers, raspberry pi and nfield) talk to this node app on hyperdev instead of directly talking to each other, which btw would complicate things as each application would then have to discover where the others are and be able to connect to them somehow. In the architecture above, as long as everyone can reach hyperdev, successful communication is guaranteed. 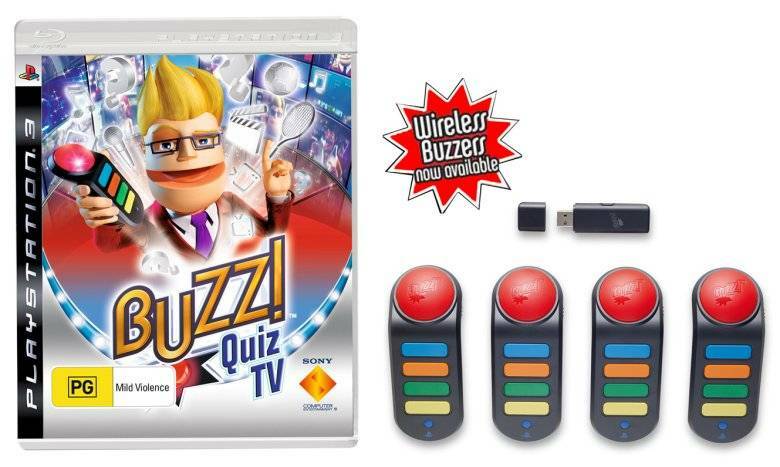 While PlayStation buzz controllers are perfect for a quiz game, the immediate question for our little hackathon project was; how do we connect to and control these things? Node.js is everywhere, it really is. 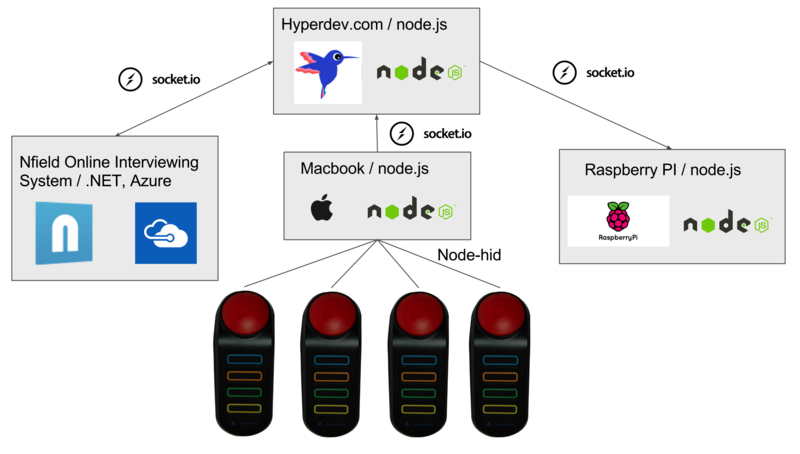 There is a node package called node-hid which allows you to access USB Human Interface Devices (HID) from node.js. It basically allows you to read from and write to these devices by using node buffers. We could even connect these buzzers to Raspberry PI but we ran into a few security issues and pivoted to using a mac instead. 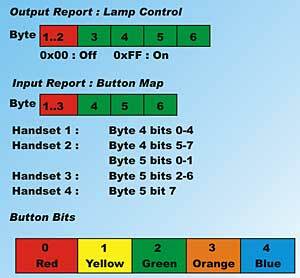 Long story short, each controller has a reserved space on a 6 byte area, inside which they flip bits on and off based on the state of their buttons. Since we couldn't succeed in reading inputs from PlayStation Buzz controllers on our Raspberry PI, we had to come up with another very useful role for it - because we simply can't imagine a hackathon project without the PI (!). One of our teammates said "let's use it to signal remaining time at each question - with some touch of tension". Then we went ahead and placed a bunch of lights on the PI and a loud buzzer. Using node.js and socket.io, it was listening to certain type of events to start buzzing with low and high frequencies. As contestants were running out of time while answering each question, the frequency of buzz and light effects were increasing. Nfield Online is a data collection platform powered by NIPO Software. A SaaS platform where market research companies can create surveys and reach their respondents. Nfield Online is bundled with a powerful domain specific language, ODIN, created for scripting simple or complex questionnaires. Nfield also has a powerful templating system where customers can create and run their own templates in their surveys (both for changing the look & feel and behavior of their questionnaires). When this template is activated on the interview, which is running our quiz, it connects to the socket.io server on hyperdev and starts listening to "button pressed" events from PlayStation Buzz controllers. When a button is pressed it receives the event and selects the corresponding answer on the quiz for that contestant. I had a lot of fun working on this project and also writing about it in this blog. Every technology company should make hackathons a part of their culture. The benefits might not be immediately clear in the beginning but all those doubts disappear after a few events.